Editor’s note: This story was updated late Wednesday morning to reflect public comments from Tom Brady and Robert Kraft. 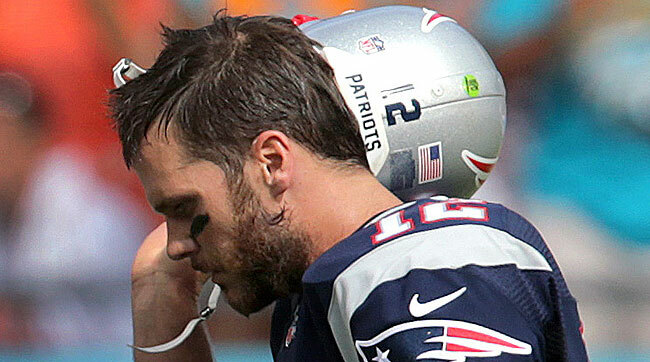 Tuesday was a bad day for Tom Brady. In upholding Brady’s four-game June suspension in last season’s alleged football-deflation scheme, NFL commissioner Roger Goodell accused one of sport’s golden boys of significantly obstructing justice in the case. And the ruling, issued two days before the Patriots’ first practice of the new season, made patently clear that only a surprising reversal in federal court will stop the Super Bowl MVP from being banned from playing in a game that counts until week six, on Oct. 18. But those strong words couldn’t eclipse Goodell’s most damaging blow—that Brady directed that the cell phone he was using at the time of the AFC Championship Game be destroyed. Brady, according to Goodell, destroyed former phones when he started using new ones. But, also according to Goodell, Brady didn’t destroy the phone he used earlier in 2014. Why? Tuesday brought another night of public silence from Brady, who declined to point out even the most basic fact, that neither Wells nor Goodell has produced definitive proof that Brady ordered the Code Red, that he told two football-preparers to doctor the balls and make them have less air than the NFL’s mandated minimum of 12.5 pounds per square inch. But Brady and New England owner Robert Kraft unloaded on the league office, on the commissioner, and on the process that resulted in the suspension this morning. Two hours later, Kraft, appearing before coach Bill Belichick (mum on the suspension) at a camp-opening news conference, lambasted the league and the probe. “Six months removed from the AFC Championship Game, the league still has no hard evidence of anybody doing anything to tamper with the PSI levels of footballs,’’ Kraft said. That’s not going to happen for a while. When they finally get to court, Brady’s lawyers will argue that the cell-phone destruction has zero merit in the case, because nowhere in the collective bargaining agreement does it say a player has to surrender his cell phone as part of any investigation. The CBA calls for players to reasonably cooperate. Brady will say he did. But in the court of public opinion Tuesday night, the piece of evidence Goodell publicized in his ruling was the final straw to some who didn’t trust Brady anyway. As a storm hit Foxboro and the home of the world champions late Tuesday afternoon, reality was setting in. A green unknown from Eastern Illinois, Jimmy Garoppolo, will likely have to duel top quarterbacks Ben Roethlisberger and Tony Romo in New England’s first and fourth games, sandwiched by matchups with top defensive coaches Rex Ryan (Buffalo) and Gus Bradley (Jacksonville) in games two and three. Minus a settlement, the league wasn’t going to give Brady any benefit, particularly after the cell-phone destruction. Goodell’s ruling was more blunt than his original ruling in June, when he banned Brady for four games, fined the Patriots $1 million and docked the team first- and fourth-round picks. Goodell also said definitively that the footballs used by New England’s offense in the AFC title game were tampered with. • He revealed that Brady “instructed his assistant to destroy the cellphone that he had been using” for about four months near the end of the season, including during the time the league accused Brady of participating in a scheme to reduce the air pressure in game footballs so they’d be more pliable, and more to his liking. • Despite significant scientific claims to the contrary, Goodell went strong with his belief that air was removed from the New England footballs in the AFC Championship Game. “At least a substantial part of the decline was the result of tampering,” he wrote. • Though the Wells Report used the term “more likely than not,” Goodell went much further. “Mr. Brady knew about, approved of, consented to, and provided inducements and rewards” supporting a system of tampering with the game balls, Goodell wrote. So many questions are left. The biggest: What are Brady’s chances in court? Two points to consider here. The NFL is seeking to have Goodell’s appeal upheld in federal court in New York—friendlier than it would be, say, in New England if that’s where Brady’s side intends to seek relief for the quarterback. This is precedent-setting, the NFL seeking a favorable venue to simply rule the league has done the right thing. Two league people could not remember that ever happening before, and certainly not during Goodell’s nine-year tenure. “The league’s playing offense now, not defense, the way it was with the Rice case,” one club official said Tuesday night. One legal expert suggested Tuesday night that Brady should be careful what he wishes for. If he barges ahead with the case in a venue such as New York—where a judge might not be inclined to enjoin the league, period, but likely wouldn’t agree to push a hearing back by six months—Brady would risk losing and being suspended for four games late in the season. Or even having the ban leak into January. But going to court with a case like this is still fairly unpredictable. Which is why I’ll make no prediction of the outcome, other than to say the league seemed very confident with that 20-page document Tuesday. For now, Brady has to face the real possibility of something that’s happened roughly two times out of every 10 games during his illustrious career: losing. With all the recent talk of Deflategate focusing on Tom Brady, I’d like to revisit a side issue that nobody’s talking about anymore. 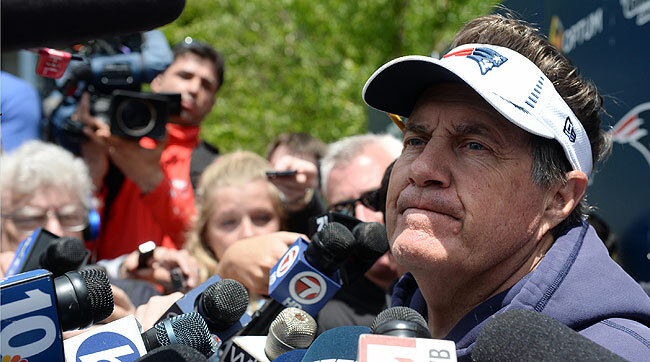 Why wasn’t Bill Belichick suspended? Roger Goodell threw the book at Sean Payton in Bountygate, saying Payton ultimately was responsible for his team even if he wasn’t aware of any bounties. By the same logic, Belichick also should be suspended, especially considering that Belichick has a prior record with Spygate. In that case, if I’m not mistaken, Belichick specifically ignored a league edict forbidding teams from filming opponents’ practice sessions. I think the lack of a suspension for Belichick helps perpetuate the belief that the league treats the Patriots differently than other teams. Saw your comments on the Hall of Fame game with Minnesota vs. Pittsburgh and your comment that it’s fitting they meet since the two are the longest serving tenants of their respective training camp sites (50 years each).The Green Bay Packers will be entering their 56th year at St. Norbert College in nearby DePere. Don’t know if that’s the longest in the league, but it’s certainly longer than the two teams mentioned. The reason I think the Packers situation is different from both Minnesota and Pittsburgh is that although Green Bay stays at a local college during camp, the Packers practice and hold meetings at Lambeau Field and the practice fields across the street from Lambeau. Minnesota and Pittsburgh are housed in college dorms and practice on the fields adjacent to those dorms. That is a significant difference. Loving the new site so far. I'm exclusively a mobile user and it's great. Thank you! Very much appreciating the clean, uncluttered new site design. So much easier on my eyes and on the bandwidth. I think the best thing I can say about your site change is: A. I didn't really notice; and B. I didn't hate it. Too many times sites spend time promoting this huge change and then they roll out an entirely new site that takes time to learn and figure out, when all you really want is a specific thing(s). So when I read The MMQB, I didn't immediately go “What the heck have they done?” It just read like normal and the changes were fine because they didn't change my experience in a way that required me to put in more effort. Love The MMQB! Any chance to get an RSS feed back? Under the old site, I had a dedicated feed that allowed me to not miss any article your site produced. Now it redirects me to all SI.com articles, when I only want The MMQB feed! Thanks! I appreciate everyone’s responses to our changeover. I’ve been pleasantly surprised that most of you seem to like what we’ve done. Particularly because, as Josh just said, most often people get upset when you change something they are accustomed. I didn’t want to create any great expectations or make it that big of a deal that we were making some changes, and that’s why you didn’t hear much from us before we rolled out the redesign on Sunday. I just want all of you to know that we will always be focused on giving all of our readers as much information in as readable and viewable a way as the web will allow. As for the RSS feed, we hear you, and are working on fixing that. Thanks for reading. As an ex-pat, living and working in London, it is always a real pleasure to read The MMQB, especially when you cover my team, the Colts. Having read a lot of the coverage you did on the expansion of the game, specifically in Europe, I wondered if you had given a trip to London any consideration as part of your preseason journey? With no team, there’s no camp, but there are plenty of us who would love the opportunity to do a Q&A or even just a tweetup. I really appreciate your kind words and the invitation. What makes a preseason trip to London so difficult is that I already have regrets over missing six or eight teams in the preseason. If I journeyed overseas to talk to football fans, I’d miss a lot more than that. The solution might be that I come to a game during the regular season and I will definitely keep that in mind in the next few years. • THE NFL'S FUTURE IN EUROPE: The NFL has worked aggressively to establish itself in London. Germany could be next. But the league still has major hurdles to clear in its quest to become a truly worldwide sport. Can it be done? No one should ever judge an NFL player harshly for getting his first big payday. Careers can be short, and the future less certain in football than any other sport. Russell Wilson is in a position to set up a secure financial future for himself and his family. If he maximizes that opportunity, and that costs Seattle fans a few of their favorite players, the correct reaction is to appreciate Wilson for the Super Bowl championship and all the winning and cheer like you always have. If fans want to judge a player *after* that first huge contract, feel free. Once a player's financial life is guaranteed, go ahead and chide him if you think he values money over winning. But no fair disrespecting Wilson for wanting security for his loved ones. I am in agreement, mostly. But Russell Wilson will be able to take care of his family whether he makes $10 million this year or $25 million this year. It’s more money than most people could ever imagine. I think it’s more about trying to earn a contract that is in line with what the market value is for top quarterbacks. Even those who don’t like Russell Wilson very much as a player would have to agree that he is a top 10 quarterback in the NFL. A top 10 quarterback in the NFL is worth somewhere in the neighborhood of $20 million to $23 million per year in 2015 dollars. So we could maybe argue about the last couple million, but it’s hard to imagine that people would not think he’s worth very close to the contract Aaron Rodgers signed more than two years ago. There are nine inductees into the 2015 Pro Football Hall of Fame. If each inductee spoke for 26 minutes, the ceremony would be a little over four hours. Given all the years they put in and the meaning they gave to the NFL, you think 26 minutes is too long for them to say thank you? First, there are eight, not nine. And to each person, you need to add a six-minute video that is played in the stadium and on television. So the videos in this particular case would add a little less than an hour. Also, this is a television show. There are commercials. My feeling is that including breaks for applause and commercials, you’re probably talking about 35-40 minutes per inductee. In my opinion, an induction ceremony of five or more hours is too long. However, I would be in favor of cutting down the time of speeches and saying to each inductee, “At the 12-minute mark, we are going to commercial. So you can keep speaking if you would like but you will be getting cut off in front of millions on TV. If you are going to have expanded classes, as so many in the public have demanded, I don’t see any way that you could have each person’s speech be 26 minutes long.